Sudan was the largest country in Africa before the secession of South Sudan. 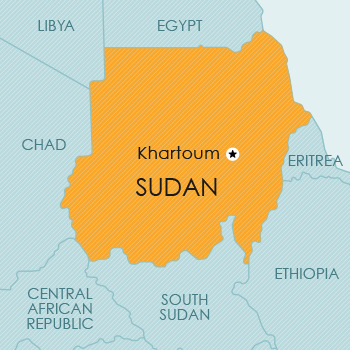 Sudan is located in the northeast of Africa, with a short coastline on the Red Sea. On the land side the country is bordered by Egypt, Libya, Chad, Central African Republic, South Sudan and Ethiopia. The Nile river divides the country between east and west sides. The southern region of Sudan was granted autonomy in terms of a Peace Agreement; South Sudan seceded from the rest of the country in 2011. Following the secession of South Sudan, the information set out below only applies to the northern part of the country, which retained the name Sudan. Sudan is a member of the Paris Convention, and the Madrid Agreement and Protocol. Although Sudan is a member of ARIPO, it has not acceded to the Banjul Protocol. Applications may be filed as national applications and, in appropriate circumstances, claiming convention priority in terms of the Paris Convention. Inasmuch as Sudan has not acceded to the Banjul Protocol, the Sudanese Trade Marks Act of 1969 does not provide for recognition of trade mark applications filed via ARIPO. Sudan is a member of the Paris Convention, ARIPO (Harare Protocol), and the PCT. Patent protection is available via a national filing or via an ARIPO application designating Sudan. Sudan has not yet implemented the Harare Protocol (which regulates patent and design filings in ARIPO). Accordingly, there is uncertainty regarding the enforceability of rights obtained through the filing of an ARIPO application designating Sudan. Although it is possible to file PCT national phase applications in Sudan, the national law has not yet been amended to cater for the PCT. Accordingly, it is not clear whether enforceable rights will be obtained via PCT national phase filings in Sudan. Sudan is a member of the Paris Convention and the ARIPO (Harare Protocol). Design protection is available by way of a national filing or via an ARIPO application designating Sudan. As mentioned above, Sudan has not yet implemented the Harare Protocol (which regulates patent and design filings in ARIPO). Accordingly, there is uncertainty regarding the enforceability of rights obtained through the filing of an ARIPO application designating Sudan. Sudan is a member of the Berne Convention. all kinds of maps and sketches relative to topography, geography or science. collections of protected works or non-protected materials, provided they constitute the result of intellectual effort. ideas, methods, state emblems and symbols. National folklore is deemed to be the property of the State. Currently, no legislative provision for plant breeders’ rights or other sui generis protection for plants is available in Sudan.